The famous glass flowers are here, as are Mayan artifacts and lots more. 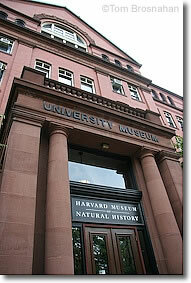 The Harvard Museum of Natural History, a short walk from Harvard Square, features changing exhibits and special shows as well as several of Harvard's extraordinary natural history collections. The world-famous collection of glass flowers features more than 3000 incredibly delicate and detailed glass replicas of flowers created by Leopold and Rudolf Blaschka between 1887 through 1936. The historic replicas were made in the days before color photography allowed a botanist to make teaching aids easily and cheaply with only a camera. The variety of flowers and other plants on view and the craftsmanship that it took to make them are truly amazing. The zoology collections are favorites with children: rooms with stuffed animals gathered around the world, from a tiny hummingbird to a towering giraffe. Sharks, ostriches, hippopotamuses and zebras abound, as do the exotic beasts from exotic places: tapirs, lemurs, quetzals, and aardvarks. The museum is a product of the 19th-century rage for natural history, which sent Harvard men all over the world in search of specimens to use in scientific teaching. Don't miss the full-size whale skeletons, in the same high-ceilinged room that houses the giraffe. The geological and mineralogical collections are an unusually comprehensive systematic mineral collection, including gems, meteorites, and minerals from New England. Newer exhibits include one on arthropods (the million-species phylum that incudes thousands of bugs, spiders and millipedes as well as crabs, lobsters and shrimp) and another on climate change. The Museum Shop is one of Cambridge's most fascinating places with wonderful collections of minerals, jewelry, books, toys, games and stuffed animals on sale. Located on Oxford Street, a 10-minute walk from Harvard Square (map), the huge and rambling museum building also houses the Peabody Museum of Archeology and Ethnology. They are both part of the Harvard Museums of Science & Culture. From Harvard Square, ask your way to the Science Center and Memorial Hall (map), then walk between these buildings to get to Oxford St. Walk north on Oxford, and the third building on your right (a large, rambling 19th-century red-brick structure) is the museum complex. Harvard Museum of Natural History, Cambridge MA.